We think dogs are amazing and we're not the only ones. The Cultured Canine tent is where we explore and chat about how dogs influence and inspire art and culture. We have a fascinating programme this year covering illustration to instagramming. Adrienne Geoghegan studied illustration at Kingston University, London. She has illustrated for The Guardian, The Economist, The Irish Times and Business & Finance. Adrienne’s picture books have been translated into many languages. She has lectured at DIT, The Irish Writer’s Centre, NCAD, Independent Colleges, BCHE and the National Gallery of Ireland. She is a dog lover and shares her family home with Tammy, a rescue dog who the family adopted when her son Oscar was 5 and Tammy was 5 months old. Tammy is now 8 and a half and Oscar is 13. Adrienne will read from her book 'Dogs Don't Wear Glasses' and then show us how to draw draw a dog. What fun! We'll chat with Mary Owens of animalactors.ie and Buttercup about their work. 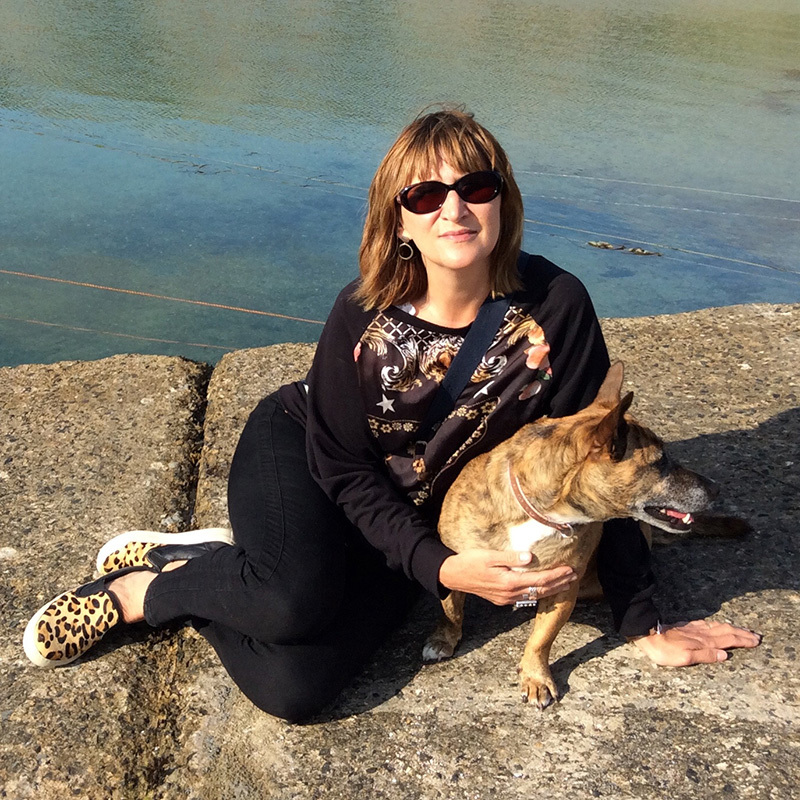 Mary trains and casts animals for everything from big studio, Hollywood movies to Irish TV ads. Buttercup, originally from Texas, has 77+K followers on Facebook. These two are sure to have lots to say about what it takes to be a star of all sorts of screens! David is a TV producer and writer, who has worked with RTÉ, BBC & HBO. This year Little Island published his fascinating book on the nine native Irish Breeds. Conor (one of our organisers) has posted a little review here and will chat to David about his research and the fascinating stories he came across in writing the book. We're hoping that we'll have some representation from the native breeds to meet him, so do come along. Audrey is an award winning pet photographer and produces the most wonderful pet portraits in her pawtrait.ie studio and the great outdoors! She'll tell us all about capturing the magic, that look, that special bond, and those amazing personalities, so you can share them with friends and family. Her '3 special tales from a pet photographer' are sure to be both useful and entertaining! 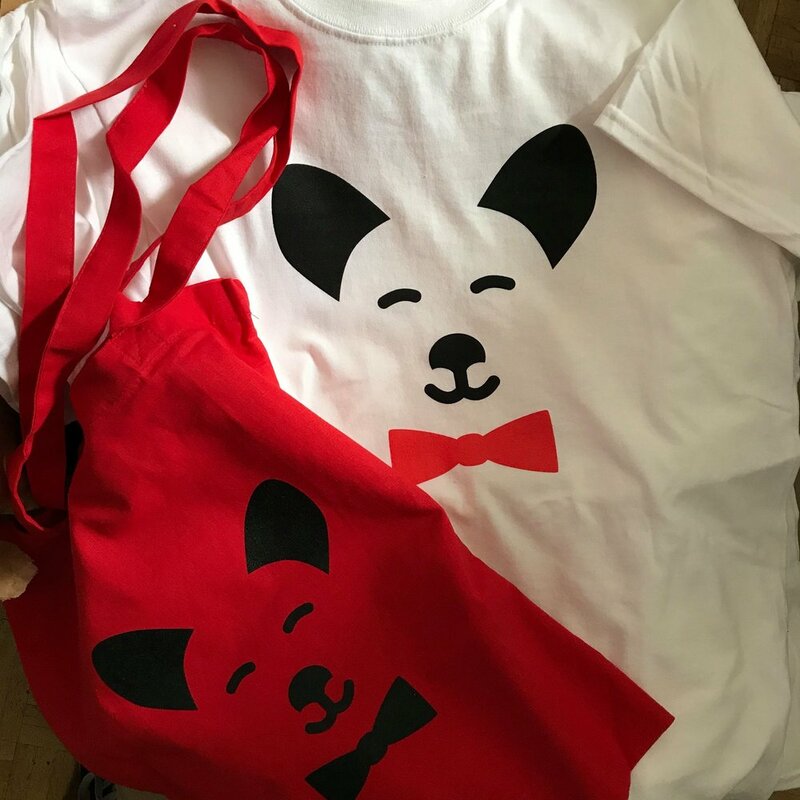 Our little stall will have some of our brand, spanking new merch (Ts & Totes), along with Jane Fogarty's wonderful work - pawpawpawpawprints, copies of 'The Curious History of Irish Dogs' and some of Adrienne's cute cards. Jane will be taking care of the stall, drop by and say hi! I devoured this wonderful book as a Labrador does his dinner, greedily gulping down passages and chapters. To be absolutely clear, this is not merely a book for the dog lovers but an insightful study of Ireland’s social and cultural history as viewed through the prism of our nine native breeds. The Curious History of Irish Dogs is a work that bears the weight of its considerable research and learning lightly and Mr Blake Knox’s lucid prose is as entertaining as it is informative. From the (apocryphal) tale of ‘Prince’, the Irish Terrier on the front lines of the first World War to the certificate of courage once required of the Glen of Imaal Terrier, there are treats and rewards to be found in equal measure. Mr Blake Knox will be in conversation with Conor in The Cultured Canine tent at 2.45 and will also be on hand to sign copies of his book. It has now been proven that dog owners end up looking like their canine companions, (seriously, click through on that link!) and vice-versa. We're inviting such pairs to enter our dog & human lookalike competition ‘Doggelgangers’ (like Doppelgängers... geddit?). This guy, Topher Brophy, and his dog Rosenbury are taking the mutt-man look-alike thing to a whole new level with an online/social-media joint-career, but we're happy to see pairs who are spirit-twins as well as lookeylikeys. Have a look at last years album here. 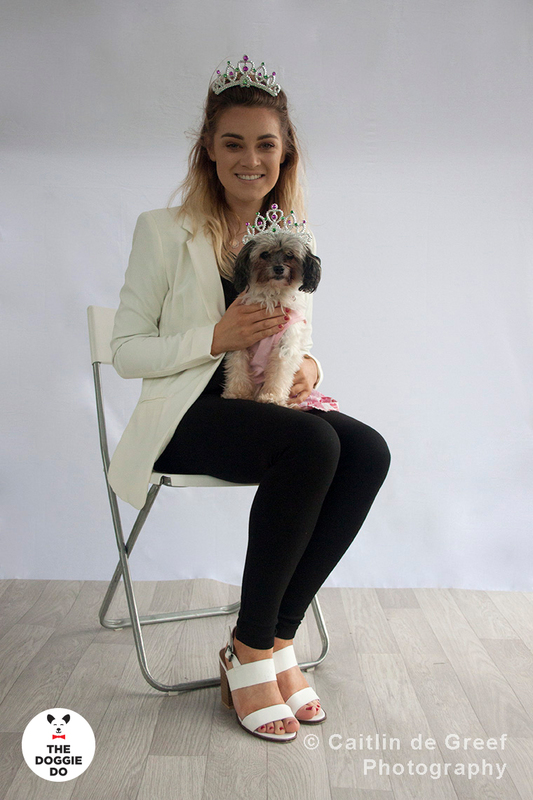 Audrey Dalton of pawtrait.ie will photograph entrants at the Doggelgangers stand on-site, and results will be posted on our Facebook after the festival for public voting. The winning lookalikes will be rewarded with a framed print of their winning shot, courtesy of pawtrait.ie! We like to cater for all comers to The Doggie Do with Dogs Trust, so for the quieter types we present Doggie & Soul, a relaxing, cosy tent where you can meet some very special animal wellness practitioners, while you chill out on comfy beanbags & cushions. "I have noticed over the years that animals can actually sense energy vibrating around the body and can feel for themselves where the energy needs to be directed to restore balance and ease pain or discomfort. By travelling to the owner’s home, the animal being treated is relaxed in their own familiar surroundings and is more open to receiving Reiki, it also allows Reiki to continue on without the interruption of a journey in busy traffic. Many of my human clients also delight in curling up on the sofa and having a nap after I’ve left." Mary will tell us more about her work at Doggie & Soul, 2:30, Sunday afternoon. Lisa Tully - Talks to the animals! Lisa studied under the globally renowned author and animal intuitive Madeleine Walker. With her one-to-one guidance, she perfected the art of animal communication and soul healing. As a clairaudient and clairsentient, she is able to tune into animals and feel their emotions. She hears their concerns and, wonderfully, receives their wisdom. Some might call this telepathy, but she prefers to call it animal talk. We're looking forward to hearing Lisa tell us about some of her cases, what she has learned about animals and how this can help you in your role as a dog carer. The Doggie & Soul tent will be open all afternoon, so feel free to visit at any time and take a little break from all the fun of the festival site. We are thrilled to announce our judging panel for The Dog of Dublin 2017! Originally a Molecular Geneticist, Mia left her day job to work alongside her DogBoss, Milo the Labrador, and together they pursue their love for art, design, dogs and Liberty London Art fabrics at her label ‘Mia Loves Jay’. Specializing in handcrafted cushion designs, quirky, fun dog and animal characters are stitched onto a backdrop of carefully selected Liberty London Art Fabric, which compliments each loveable beastie character. Passionate about animals, she started out by donating her designs to her local animal shelter. From there, she began receiving individual commissions. Designs have been snapped up by famous personalities (including Neville Jacobs - Marc's dog) and she continues to support animal charities worldwide. She'll be keeping a close eye on the contestants sartorial presentation! Grand high witch, fashion icon and drag legend Veda, has spent the last twenty years on cabaret stages around the world becoming the over night success she is today. She's a self made man made women and drag mother. Elements of magic, mayhem and mystery make this spellbinding entertainer one of the high lights the Dublin cabaret scene. We are delighted to have her expert eye for style and stage presence on this years panel. Sashay! 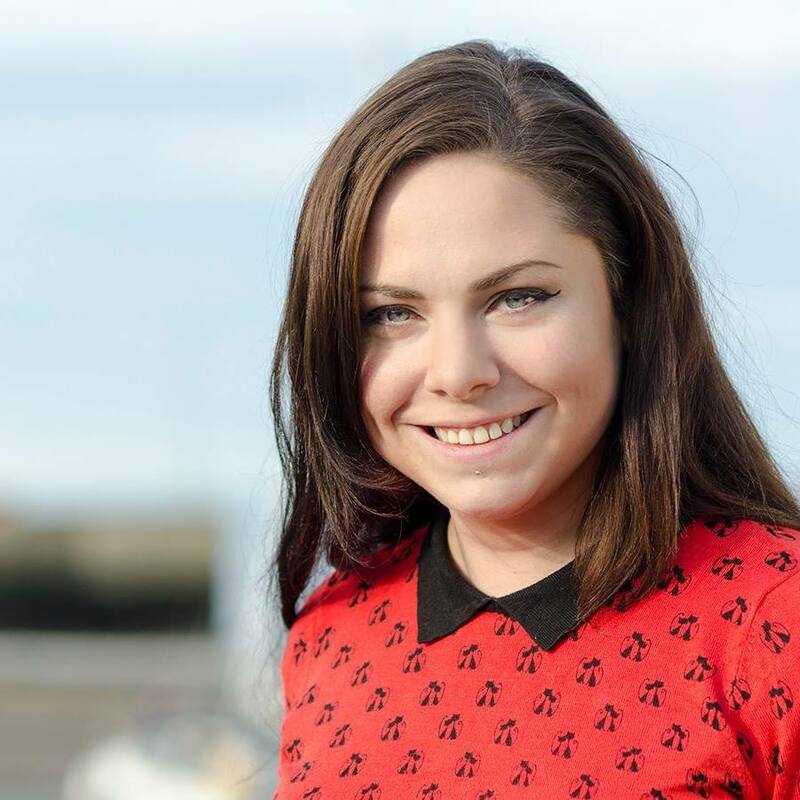 Claire Buckley is the Managing Director of Buck & Hound – a Dublin based consultancy that offers PR, social media and event management services. The company began in her home office as a solo endeavour with her trusty pooch, Stella by her side. It has since flourished offering consultation to incredible clients including The Doggie Do without ever losing sight of its humble beginnings – hence the name Buck & Hound. Claire is an unapologetic dog nut and fashion lover and so is well placed amid the esteemed panel of judges at this years Dog of Dublin event. So the Doggie Do has come and gone. We're still beaming with delight at the wonderful success of last Sunday and are most grateful to all our two-legged and four-legged friends for coming out and supporting the event. Firstly we'd like to congratulate Tippi, our new Dog of Dublin 2016. She was a runner-up in 2015 and morphed from a Doggerpillar into a beautiful butterfly and is a worthy winner of the accolade. Our MC Darren Kennedy, who we're now calling 'Our Dáithí', exuded his effortless charm in coaxing the story behind each contestant which was subject to intense consideration and debate by our delightful judging trio of Zoe Carol, Steven Mannion Farrell and Irene O'Brien. Our friends and supporters at Dogs Trust packed their tent with informative and fun talks throughout the day while we had master classes in illustration and photography as well as a chat with some artists and craft-makers and how dogs influence their work in our Cultured Canine tent. You can check out the keen eye of Audrey Dalton from Pawtrait who documented the style and panache of the dogs in attendance on our home page. And our Doggelganger competition with photos taken by Caitlin de Greef is now active on facebook where we will select a winner soon. Check it out to tag yourself and vote. Our special guest John Grogan, the author of Marley and Me, offered humorous insights into the dog and book and movie which had such an impact on his life in conversation with Andrea Hayes. from TV3's Dog Tales. Our Doggie and Soul area proved the perfect chill-out zone for those who were panting with too much excitement and our Rainbow Bridge Tree was a poignant place to remember all our cherished doggies who have left us. We would like to thank our ReTail therapy stalls who showcased an array of high-quality products created with your canine in mind. A Round of A Paws too to Dublin City Council for their support and allowing us use the beautiful surrounds of Herbert Park on the day. And last but never least our volunteers and friends who made everything run so smoothly on the day. We're already planning the third Doggie Do in 2017 and hopefully some more exciting events to build upon the love of the community. Please feel free to share any images or feedback regarding what you would like us to do next and who you would like to see at the next Doggie Do. We've just added lots of new content to the site. Make sure you have a good look around to get all the information you need for Sunday. Lisa Dillon is a Tellington TTouch Practitioner. TTouch promotes well-being and adaptive behaviour through understanding and respect, that helps to reduce stress and build confidence. Learning just a few of the simple body TTouches and movements can help make a difference to an animal’s life. Lisa Tully believes that our dogs have much to teach us. As an animal communicator she can help you understand what is it they need and want to tell you. She also helps animals themselves in finding their voice by bringing physical, mental, emotional & soul level healing. Doesn't that sound fascinating? Drop by Doggie & Soul at The Doggie Do - give your puppo a little time out and maybe pick up some tips on how to understand them even better! Your dog's 15 minutes of fur-fame! It’s the weekend, hurrah! Time to get out and about with our doggies. Our friends at Micromedia.ie want us to show them our pooches on their weekend strolls. Whether you’re heading into town, down the pier or round the park share your pooch pics with us, on whatever social media platform you frequent with the hashtag #thedoggiedo The best-in-show will appear on Micromedias cool digital screens around the city in the run up to The Doggie Do next Sunday, Sept 11th. Get sharing your pics - your doggo deserves their 15 minutes of fur-fame! THE DOG OF DUBLIN 2016 - Canine Costume Competition! Last year we saw pugs in pearls, radiant rescues and themed human/dog pairs strut the ‘dog-walk’ in competition for the inaugural 'Dog of Dublin' title. The eventual winner was the wonderful Missi, a senior lady with arthritis. Her best friend, Vivienne, helped her out by creating an amazing Moulin Rouge themed costume for both of them, including a glamorous push cart for little Missi. Lucky also wowed us with his classic hot-dog look and the ‘dog-a-pillar’ Tippi made us laugh with his brilliant mulit-legged, home-made get-up. Does your best fur-friend have personality, style and panache? Do you think they’ve got what it takes to impress our judges? If so, fill in our registration form today and getting planning that costume! DOGGELGANGERS - a dog and human lookalike competition! Michelle Howie of petpawtraits.ie will photograph entrants at the Doggelgangers stand, and results will be posted on our Facebook after the festival. The winning lookalikes will be rewarded with a framed print of their winning shot, courtesy of petpawtraits.ie! Most of us have had to deal with the passing of a beloved fur-friend in our lives shared with dogs. We’d like to remember all these brilliant bow-wows at The Doggie Do 2016. Everyone who wants to join in is invited to come to the Rainbow Bridge Tree on site, write your pets name on a rainbow ribbon (supplied) and tie it to the tree. Rainbow Bridge Memorials will be on hand with a great competition to win €600 worth of their beautiful memorial jewellery. Say hi to Jennifer at the Rainbow Bridge Tree and put your name on the list to be in with a chance to win! The Cultured Canine - Inspiring Dogs, Inspiring People! It seems to us that we spend a lot of time looking at our dog buddies. We keep an eye out when they are active and we watch them doggie-dreaming. It should come as no surprise that a lot of people in the arts community are similarly inclined - these individuals just happen to turn their observations into something more…We’ve decided to bring some of these talented, creative types together to talk about mutts & magic at our new tent - The Cultured Canine. Steven Mannion-Farrell, Geraldine Murphy and Mia have all been inspired by their fabulous fur friends to create unique works of art & design. Steven is Heather Humphrey's favourite artist, Geraldine (Saba Jewellery) set an MA from Emerson aside and Mia (Mia Loves Jay) swapped Molecular Genetics for Liberty Fabrics. We'll chat to these talented individuals about how putting the dog at the centre of their creativity opened up new and exciting routes to inspiration. Who knows, you might even be inspired to chuck it all in to make dog pottery yourself! Audrey Dalton of pawtrait.ie will share hints and tips on getting the most from your phone's camera when trying to capture your pup’s personality. Audrey is a commercial photographer but Pawtrait is her pet project, providing a bespoke pet photography experience in the beautiful Cherrylane Gallery, Greystones. When she’s not in the studio photographing other peoples dogs, you’ll find her down at the park with her two rescues, Ozzie & Io. You’ll know Fuchsia's colourful illustrations from all over; city junction boxes, a tourist map or two from in-flight magazines and she’s just been commissioned by search colossus Google to tackle her biggest ever canvas to paint up their giant data centre. 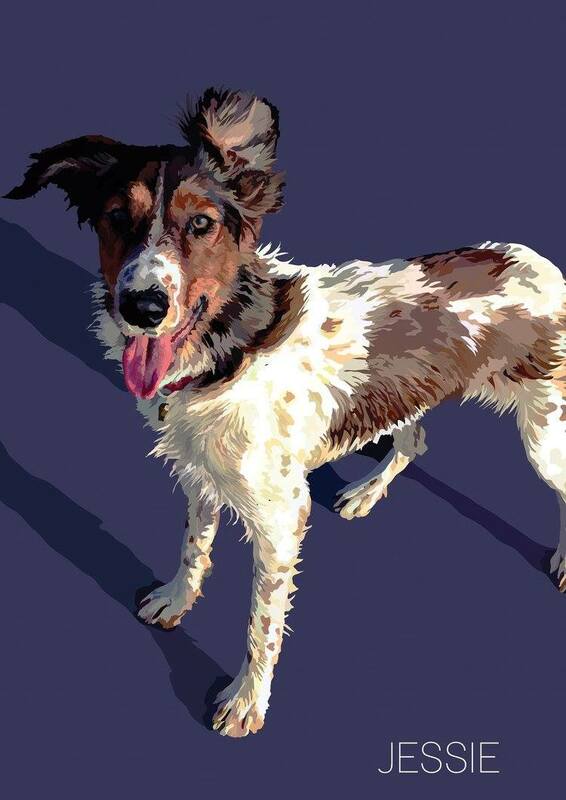 At The Cultured Canine, she will guide young artists in a hands-on workshop to help them draw the dog of their dreams (or at least something that looks recognisably like a dog)! The Doggie Do Crew is just thrilled to announce that John Grogan, author of one of our favourite dog tales Marley & Me, will be joining us for an exclusive Irish appearance and Q&A. Marley & Me tells the story of John & Jenny's adorable Labrador Retriever and the impact of its love on their lives. The #1 international bestseller (which sold over five million copies in more than thirty languages and spent 76 weeks on the bestseller list! ), was adapted for the film starring Jennifer Aniston and Owen Wilson. We are absolutely delighted to have John join our line-up and can’t wait to chat to him about Marley and his other dogs! This year's Doggie Do is really shaping up to be bigger and better in every way with Dogs Trust joining the pack in our amazing new Herbert Park home. We’ll be sharing lots more programming news soon. Following the overwhelmingly enthusiastic reception to our inaugural Doggie Do festival in 2015, we are just tickled to announce news of our rehoming for September 2016. This year's festival will take place on Sunday, September 11th in the lush, leafy surrounds of Herbert Park in Dublin 4 and will be supported by the good folks (and good deeds) of Dogs Trust. We will be announcing programme and ticket details along with information about our search for the Dog of Dublin 2016 real soon. In the meantime, here's a reminder of all the fun we had at Merrion Square last year. If you would like to be involved as a vendor or volunteer, please do get in touch. Judges announced for The Dog of Dublin competition and lots more news about our programme and what to expect on the day... THIS SATURDAY! Which movie should we show? Programme news announced today... and more to come!